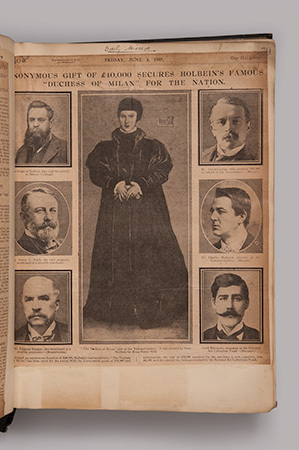 Recently discovered in an Italian archive by by Colnaghi's Head of Academic Projects Jeremy Howard is an announcement card sent to the Florentine dealer Stefano Bardini in June 1894. 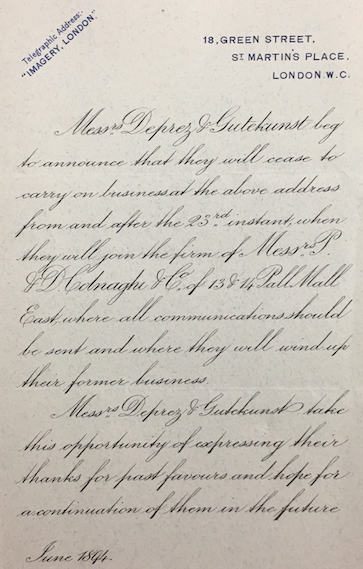 Otto Gutekunst and Edmond Deprez were writing to their clients to announce that they would be ceasing carry on business at their old address of 18 Green Street, St Martin's Place to "join the firm of Messrs P and D Colnaghi of 13 and 14 Pall Mall East". The card concludes "Messrs Deprez and Gutekunst take this opportunity of expressing their thanks for past favours and hope for continuation of them in the future". Within 6 months of the announcement, the new partners had launched the firm in a new direction, transforming the venerable old print-shop into a major dealership in Old Master Paintings, and selling in December of that year their first important painting, a Botticelli, to the American Collector Isabella Stewart Gardner. Over the next forty years, Colnaghi was responsible for some of the greatest sales of Old Master paintings to American Gilded Age collectors such as Mrs Gardner, Henry Clay Frick and Andrew Mellon". P&D Colnaghi Ltd was set up in 1760 in St James’s London, and has been dealing in art in paintings, prints, and drawings ever since. Most of the records are held today at Waddesdon Manor in Buckinghamshire and consist of stock books, correspondence, exhibition catalogues, financial records, and catalogues published by Colnaghi and others. 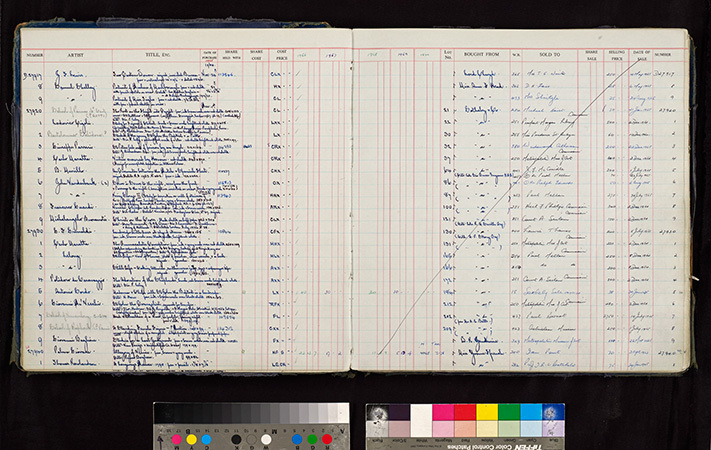 The main series of correspondence and financial records do not start until 1894 and the stock records start in 1911. All researchers are required to complete a researcher agreement. Digital photography for research purposes is normally allowed on completion of copyright declaration. The archives are housed at Windmill Hill on the Waddesdon Estate not at Waddesdon Manor. Before you visit download a location map.